Here we go again! Another great give away (apparently when I wear my Way Huge shirt I get a strange need to give stuff away – interesting). What’s better than giving away a pedal? Simple.. give away a pedal with a freaking 12AU7 tube sticking out of it! If you’re in search of some sweet tube goodness from a pedal, the Lightning Boy Audio Soul Drive will answer that call! 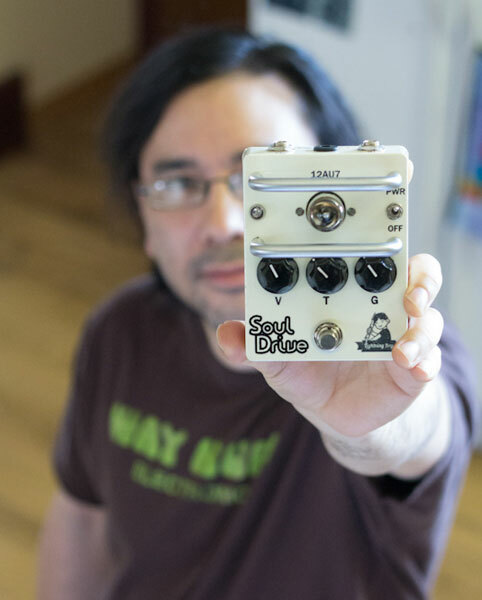 The fine folks at Lightning Boy Audio were kind enough to send us a Soul Drive to demo and we did. You can view the demo here – “Lightning Boy Audio Soul Drive Demo“. Also, if you’re interested in learning more about the man behind Lightning Boy, check out this interview – “1 on 1 with Lightning Boy Audio Engineer, Mike Congilosi II“. The guys at Lightning Boy Audio also wanted me to give away this sucker when we finished reviewing it and here we are today – ready to give this away to a very lucky EffectsBay reader (the Soul Drive sells for $250)!! Please be sure to check out their web site, follow them on Twitter as well as Facebook. They’re making some great stuff, so be sure to stay closely connected with them! I’m going to select one random entry on March 27th. I will email that random entry asking for the answer to the question listed below. They will have 24 hours to respond with the answer. If the 24 hours passes and I don’t hear from that finalist, I will select a new random entry and repeat the process until I receive confirmation from the winner. This is open to everyone. Yes, that means international! Also, one entry per person. Please read that last sentence again… “one” “entry” “per” “person”. The submission form will be open until March 27th (Wednesday) 2PM MST. So, it’s pretty much a no-brainer to like Effectsbay on Facebook! Just click the ‘like’ below. Caroline Guitar Company Wave Cannon – Bueller? Bueller? Bueller?